The Countryman is the first four-door Mini. HAMBURG -- Mini's latest model, the Countryman, will help the brand reach sales of 300,000 “in the near future,” CEO Wolfgang Armbrecht said. The BMW-owned brand sold 216,000 units last year. BMW insiders expect between 40,000 and 50,000 Countryman models to roll off the line at contract manufacturer Magna Steyr in Graz, Austria, in the first full production year. That will take sales to nearly 260,000 units in 2011. Armbrecht expects the Countryman, Mini's first four-door car, to attract new customers to the brand. The crossover, which has a raised seating position to give it an SUV feel and optional all-wheel drive, is the first Mini with a body measuring more than 4000mm (157 inches) in length. 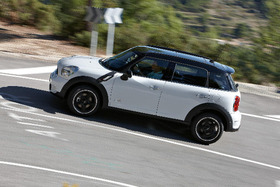 The Countryman will arrive in dealerships across Europe on Sept. 18 with a base price of 20,200 euros. It is due to launch in the U.S. early next year. “We'll bring out the Countryman in Asia at the end of the first quarter,” Armbrecht said during a press event here. The car will be available in all BMW's global markets by late May 2011. Mini's biggest sales market is the U.S., followed by the UK. China is in third place among the brand's most important markets while Germany ranks fourth. Since the Mini benefited from the Berlin government's scrapping bonus last year, Armbrecht is not counting on a sharp increase in sales in Germany this year. Mini also plans to expand its model selection by introducing a coupe late 2011 and a roadster in 2012. There are other plans for a mini-Mini, a city car positioned beneath the Mini One, as well as for a Mini van. Armbrecht is satisfied with the Mini's performance during the first half of this year. In that period, 109,309 Minis were sold, an increase of 7.6 percent. In June, total new-car sales were at 23,202, an increase of 4.2 percent. The sales increase was impressive because Mini is currently selling its “oldest model lineup” since the re-introduction of the Mini brand in 2001, Armbrecht said. Simultaneously with the Countryman launch, Mini is introducing a re-worked model family with some design changes, a wider selection of engines and a revised equipment program. The updated Mini generation will have changes in its air intake in the front bumper. Other upgrades are newly designed LED rear lights and redesigned side turning signal lights. New exterior colors and advanced audio and navigation systems will round out the offerings. Armbrecht isn't fretting about Audi's introduction of its A1, a direct competitor to the Mini. "We look forward to each and every competitor," he said.